Because of the wide breadth of subject areas in a data warehouse supreme, it has numerous data sources. The good news: Because many of the sources are external to your own warehousing environment, you aren’t personally responsible for all the extraction, transformation, and loading to get them into your warehouse. The bad news: Someone has to perform those tasks, and you have little or no control over elements such as quality assurance processes or how frequently the data is refreshed. There’s more good news, though: Because the most critical part of a data warehouse supreme is still internally acquired data (the data coming from your internal applications), from that aspect, the things you do today to make the data warehouse-ready will still be done in the future. Because you populate your data warehouse supreme with multimedia information — in addition to traditional data, such as numeric, alphabetic, and dates — the types of data sources broaden from traditional applications to video servers, Web sites, and databases that store documents and text. The Big Four types of business intelligence included in the data warehouse deluxe — basic reporting and querying, business analysis, dashboards and scorecards, and data mining — are all part of the data warehouse supreme environment. Of the four, the most significant advances and improvements during the next few years probably will occur with data mining while vendors push enhancements into their products. However, these user-access methods will be relegated to providing information that will be visualized in other forms. The business intelligence tools will enable users to pull information from the data warehouse supreme and integrate it with a better visualization — for instance, Google Earth or Microsoft Virtual Earth. Such combinations, known as mash-ups, are becoming more prevalent and enable users to see the data from the data warehouse supreme in more realistic forms — not columns on a report, but dots or shadings on a map. The biggest difference between today’s state-of-the-art data warehouses and the data warehouse supreme, however, is the dramatically increased use of push technology. By using intelligent agents (“assistants” you program to perform certain functions for you), you can have information fed back to you from the far ends of the Internet-based universe, not to mention your own large data warehouse servers within your own company. 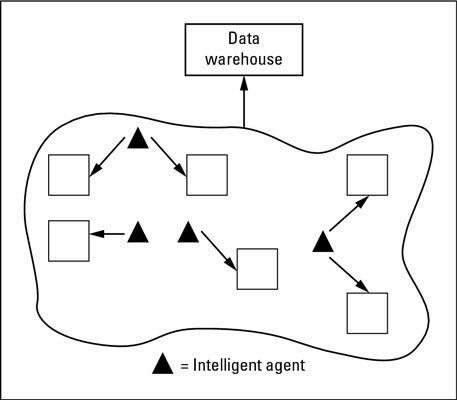 This figure illustrates some of the ways in which intelligent agents can help you make very efficient use of data warehousing.